Last weekend, I spoke about practice design at the USA Basketball Coaching Clinic in Mt. Vernon, New York. One big issue with practice design is the distinction between technique and skills, and the transferability of both to game situations. There are three arguments in the above exchange. 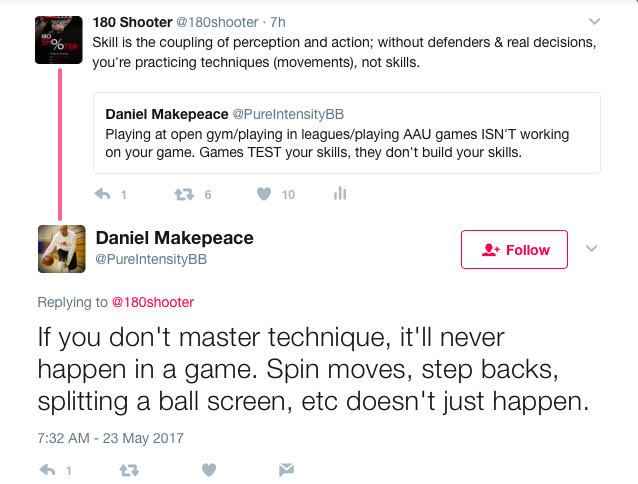 First, a post that games, including open gyms/pickup games, do not build skills. If you take this to its logical conclusion, one might argue that practice scrimmages or small-sided games in practice do not build skills. Where does “game” end? If a coach calls 3v3 in practice a drill, does it build skill? As I have written extensively in the last 10 days in the Hard2Guard Player Development Newsletter, play is learning. Second, I responded and defined skills and techniques as separate entities. Within the literature, that is not accepted, as the two tend to be used interchangeably, but within my writing, I separate the two to facilitate understanding. Techniques are the actions or movements; skills couple the perception, or the decision-making, with the action. Therefore, in most practice settings and drills, players practice techniques, not skills. Finally, there is the chicken-and-egg argument; does technique precede skill or can one perform the skill without mastering the isolated technique? This changes the argument. The original argument centered on whether or not one can build skills without games; the third argument was that one must master technique before attempting something in games. This is believed almost universally by coaches. This is why we do drills. This is why we start with the most simple actions. But, is it true? Can we perform actions in games that have not been mastered in practice? Yes. I watched an NBA team’s workouts. The assistant coach had the point guard attack and shoot a goofy foot layup: a right-handed layup jumping off of the right foot. The player never managed to perform the move correctly. Did the practice, as unsuccessful as it had been, enable him to shoot the layup during the game or did the task constraints — the angle of the drive, the rotation of the taller player, the speed of his drive, the lack of an available passing option — combine in a way that afforded no other finish? Did the instruction and the individual practice build that skill or did the environment create the affordances for that skill execution? I don’t know for sure. However, it was clear that he did not master the technique during the practice because he never performed the shot correctly. It also was clear that he performed the shot during the game, and he continues to use the shot in games, as several people pointed out this exact shot by this player during the playoffs. Is unsuccessful practice enough to master a technique and transfer the skill to a game? Is there learning that occurs in game play? Can players perform moves and skills that they have never mastered in isolated practice? Brian thanks for sharing. Enjoyable read as always. My take on this drills vs SSG (small sided games) or CLA (constraint led-approach) to learning is as follows. The issue for me is the amount time and dedication given to isolated drills with cones, tennis balls, chairs etc. For example I would love to know the number of isolated drills on youtube in comparison to CLA drills. If a coach wants to introduce a new skill I am ok with brief moments of drills in isolation, I don’t support or want to use this method, however I am willing to accept a very small percentage of time with that. Personally I support an approach with more variables than prescribed actions where the environment is the teacher and the athlete has to deal with aspects of unpredictability. One other thing to consider is why coaches are staying firm with prescribed drills. Is it choice and belief, unawareness or possibly ego driven. Therefore can we categorise the use of drills, SSG or CLA in coaching to fit with either coach centred and athlete centred coaching? Surely one can argue that any work we do to improve others should be a learner centred approach. More recently there is plentiful research that unpicks effective learning. Jarvis (2007) addresses it well with his principles of ‘maintenance vs innovative learning’, highlighting that maintenance learning is stable reoccurring situations. Can we link that to isolated drills? Whereas, ‘innovative learning’ is more unpredictable and requires ‘disjuncture’ and problem solving. Can we link this learning style to SSG/CLA? If so, we may have a very interesting debate with many coaches as from my experience many current coaches will categorises themselves as athlete centred coaches. But does using isolated drills over a CLA allow you to be an athlete centred coach or coach centred? In the many debates I have with my coaching colleagues on this topic, I feel the major barrier and resistance to eradicating isolation drills is coaches perceptions on what SSG and CLA actually looks like. Many of these isolated drills can simply be tweaked or adapted to add the element of unpredictability to whatever degree is appropriate for the athlete. Very often it is just a matter of coach creativity which can be enjoyable for both athlete and coach. Maybe the big picture needs perspective more regularly, what does the athlete need to to succeed long term, to enjoy and play long term and to maximise their capabilities. All points towards a ‘learner centred approach’ to coaching and teaching. Alan: In my debates, I feel that the major impediment is (1) tradition or (2) the belief that technique precedes skill, and one cannot learn a skill with the prior knowledge and mastery of the technique. Now, that is not how we learn any non-adult led activity. We do not receive explicit instructions and isolated drills to teach crawling, walking, and running. Once we have learned to run, we may do drills to refine our running technique or to train certain elements of running, especially if we participate in track and field or suffer an injury, but most children to learn by chasing something or by being chased – that fits with a constraints-led approach. Sports skills, however, seem to be viewed as something else, as a special class of motor skills that require copious amounts of specific practice and intervention. They are not viewed in the same way that we view walking or running. Maybe those distinctions are accurate or warranted. Maybe not. Is throwing a ball a fundamental skill like running or jumping or is it a sport-specific that must be trained differently? Do we suffer so many arm injuries because we treat it as a special skill and not a fundamental skill? I think we have developed this idea that you have to master a technique before you can play a game that incorporates that technique. When I was young, we played first and refined second. Now, we refine first and play second. I think it makes more sense to play first, and when one finds something that he or she wishes to improve, then the person can practice to refine that skill; again, even K. Anders Ericsson would agree with that idea: passion for the activity precedes deliberate practice because you have to have the interest to devote the time, energy, and concentration to the task. I think it also happens because we underestimate children’s ability to learn.